(NewsUSA) - Joanne C. was 74 when she had a stroke two years ago that left her paralyzed on the entire right side of her body. She refused to accept that she'd end up in a wheelchair and began rehabilitation, determined to get her life and body back to where it was before her stroke. Joanne's hard work paid off. She has regained much of her strength and movement and can walk again. In large part, she credits her SilverSneakers exercise classes - offered through her HumanaChoice® PPO, a Medicare Advantage preferred provider organization (PPO) health plan - as key to her successful recovery. Being a SilverSneakers member helped keep Joanne in good physical condition before her stroke. "SilverSneakers helped me be familiar with many of the exercises they had me do in physical therapy and gave me the confidence and strength to persevere through a difficult rehab process," Joanne says. However, there are challenges that prevent many Medicare beneficiaries from joining gyms and fitness classes. 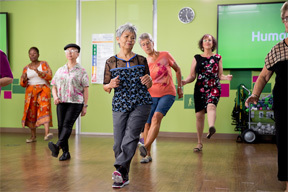 By offering SilverSneakers through its Medicare Advantage (MA) plans, Humana is working to overcome those barriers so more people with Medicare can benefit from exercising. For those on a fixed income, joining a gym can be expensive. SilverSneakers provides gym access at no additional cost to many of Humana's MA members across the country, including those in Florida and Texas. SilverSneakers has partnered with almost 14,000 fitness and wellness centers around the U.S. and, with national reciprocity, SilverSneakers members can go to any one of those facilities. The program is designed with the Medicare population in mind and taught by certified instructors who offer classes and modifications for all fitness levels. These instructors are specifically trained to help members avoid stress-related injuries to muscles and joints. There's also a wide variety of classes offered, including circuit training, yoga, Latin dance and even an outdoor boot camp. SilverSneakers members also have access to all of a facility's amenities, which can include a range of exercise equipment, weight rooms and swimming pools. "According to Tivity Health's annual survey, SilverSneakers has made a significant difference in the lives of many of our Medicare Advantage members, not only in their physical health, but also in their social life," says Lauri Kalanges, M.D., Humana's Medical Director of Medicare Products for the Mid-Atlantic Region. For more information about SilverSneakers, go to www.silversneakers.com. Humana is a Medicare Advantage HMO, PPO and PFFS organization with a Medicare Contract. Enrollment in any Humana plan depends on contract renewal. This information is not a complete description of benefits. Contact the plan for more information. Limitations, copayments and restrictions may apply. Benefits may change each year. SilverSneakers is not offered on all Humana MA plans in all areas. 1. Nguyen Q, Ackermann RT, Maciejewski M, Berke E, Patrick M, Williams B and LoGerfo JP. Managed-Medicare Health Club Benefit and Reduced Health Care Costs Among Older Adults. Prev Chronic Dis 2008;5(1).